North Korea has claimed Michael Wolff's bombshell new book about Donald Trump spells the end of the US president's political career. Fire And Fury: Inside The Trump White House paints Mr Trump as a leader who does not understand the weight of his office and whose competence is questioned by aides. The president and other White House aides have blasted it as inaccurate trash, b ut it was the top-selling book in the US last week and its numbers are likely to grow far higher. On Thursday, the North's main Rodong Sinmun newspaper, run by its ruling Workers' Party, carried an article about the book's subject matter, how Mr Trump reacted and why it is selling so well. Its sales reflect "rapidly surging anti-Trump sentiments in the international community", the article said. The book's popularity "foretells Trump's political demise", the article said. Last summer, Mr Trump threatened North Korea with "fire and fury like the world has never seen" in an exchange of taunts with the North, which claimed it was examining plans to launch missiles towards the American territory of Guam. Mr Trump and North Korean leader Kim Jong Un have since traded threats of war and crude insults, as the North conducted nuclear and long-range missile tests. Mr Trump called his rival "Rocket Man" on a "suicide mission". Mr Kim called the 71-year-old president "the mentally deranged US dotard". In his new year address last week, Mr Kim said he had a "nuclear button" that could target weapons at anywhere in the US, and Mr Trump responded that he had a much bigger and more powerful "nuclear button". Recently, Pyongyang has taken steps towards improving ties with rival South Korea in what critics call a tactic to divide Seoul and Washington and weaken US-led international pressure and sanctions. On Tuesday, it had its first formal talks with South Korea in about two years and agreed to send a delegation to next month's Winter Olympics in the South and hold military talks aimed at easing front-line animosity. But North Korea has not stopped its rhetoric against Mr Trump. Last week, the North's state media called him a "war maniac" and "madman". After Tuesday's inter-Korean talks, he said during a phone conversation with South Korean President Moon Jae-in that the US was open to talks with North Korea "at the appropriate time, under the right circumstances", according to a White House statement. 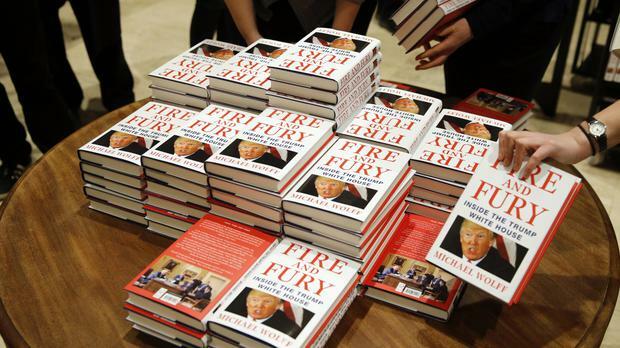 Fire And Fury was released last Friday and had sold 29,000 copies by the end of Saturday, NPD BookScan said. Digital sales already top 250,000 and audio sales exceed 100,000, according to Macmillan, the parent company of the book's publisher, Henry Holt and Co. It has raised an initial announced printing of 150,000 to more than a million.